When the stars are as bright as diamonds against the black abyss and the moon is highest in the sky, that's when she likes to walk. The soft chirps and buzzes of various nocturnal insects are soothing, the cool night breeze, invigorating. Her very being feels more at home, more comfortable, in the light of the moonlight. It was also the best time for thinking, exploration, contemplation, and others of the type. As she stepped forward, the thick blades of grass tickled her hocks. She lifted her nose into the air, taking in a long, deep breath of crisp summer night air. It felt good. Before she could take another step, a rather large black cricket leaped into the air and landed rather purposefully on her nose. Her eyes crossed, attempting to look directly at it. His tiny feet began to itch her skin, however, so she briskly shook her head. The crimson locks of her mane danced around her face wildly, and she closed her eyes to avoid them. She fully expected the cricket to have abandoned ship, but when she opened her eyes, he remained at the tip of her nose. Excuse you... she muttered, and lowered her head. The cricket's unusually meaty legs shifted about, as if he had barely even needed to hold on during that commotion. Flux glared at him, well, best she could. She inhaled to her maximum lung capacity and in one big snort, let it all out. If the muscle vibration didn't scare the thing away, the loud noise most certainly would. Despite her efforts, the bug remained. Irritation and slight panic began to creep up on her. Determined to rid her nose of the intruder, she leaned forward and lifted a front leg, attempting to brush her nose with it. Just as her pastern reached her nose, the cricket jumped. For the split second the cricket was in the air, Flux felt accomplished. That is, until it landed further up her face between her eyes. At this point, it began to crawl around. Chills ran down Flux's neck, giving her a very creepy crawly feeling. She shook her head again and again, confident the thick locks of her mane would brush him off and she'd be done with it. The cricket held on for dear life, and unexpectedly climbed up to her mane and into the hairs between her ears. Flux's ears twitched, the itchiness now overwhelming. This was too much. After a quick look around to confirm she was indeed still alone, she dropped to the ground and began to roll. Kicking her legs into the air to help keep her balance, she rolled onto her back and began to wiggle back and forth. The entirety of her neck and mane rubbed against the ground, back and forth. This technique would work for sure, it had to. Last edited by Aria on Wed Apr 03, 2019 12:29 pm, edited 1 time in total. occl Hope its ok I join, my posts may be a bit of days in between as this is my season for my migraines. Makes it hard to think and concentrate. BICL: Chilling blue, with haunting purple figure slipped from the nearby forest edge. He moved with complete silence and grace. One could ponder was he floating like a ghost of the ground, or was he indeed walking. His eyes were closed, enjoying the night breeze coursing over him, as well as the peace that comes with the diluted sounds of the night. Not the crazy or blinding light or energy. Don't get him wrong he liked the day, being an Eternal Sun affinity but his ideal daytime was one with blue skies and the sun playing hide and seek among the clouds. Or just as dawn breaks or dusk falls, the bright colours fill the world but not all the sounds of mid day. He opened his ruby eyes and gazed at the field and its stillness. He enjoyed the night, it felt more his element than the sun, however maybe that was because he was always on his own and doing what ever he wanted. He never would get asked where are you off too at night when most of the worlds inhabitants were off to dream land. He flicked his eyes around when a sound of a snort caught his harks. Spectre lifted his head to the sky and took in the night scents, though all he could smell was the night its self, grass and sleeping blooms. He was upwind of the breeze, so his scent was carried but he could not pick up others down wind. He closed his eyes in a moments thought, flicked his head and began to walk in the direction of the sound. Over the next hill he stopped and watched the scene below him. 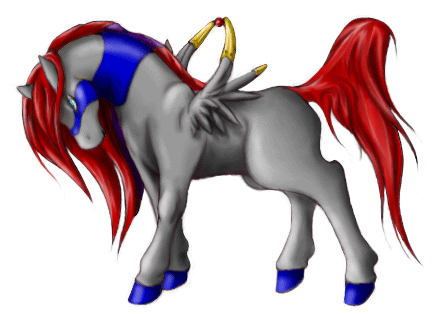 A silver mare dashed with royal blue and flaming red was rolling around on her back vigorously. He watched through his ruby orbs and tried to see what was going on. Rolling in grass was not his idea of fun, put from always being the observer, he learned that many liked it. It did not matter what the ground covering was; grass, mud or dirt. Though being a watcher, he wait for her to notice him their, if she even did. Him at the top of the long hill and her near the bottom or the rolling land. His view was one from a slightly raised elevation and from the side, he would not be a huge lurking shadow over her. Spectre gave her a once over, encase this was an action of distress, but found no sign of anything. Though with the way she was throwing power into her rocking, made him think it was not for fun or pleasure. There was a certain reason for her behavior but not something that his eyes could detect. OOC| Hopefully it's ok for me to jump in? BIC| Your Princess is proud of you, Scythe said, and gave her spikey companion a gentle bump with her shoulder. She was the first one you could extend your loyalty to, wasn't she? Thorn curved his lips in something that was only just less than a smile and took his time to answer. It was a beautiful night, crisp and clear, and the air was the perfect warmth to leave one feeling drowsy and content. The stars danced, and the grass burst with sharp, sap-like sweetness underhoof. The wind played its music and the small night creatures sang to the melody, as all the while the moon lit their shadowy stage. She fixed something in me, something I hadn't known to fix, he finally said, and there was a note of awe to his honey-smooth voice that was hard to miss. He was utterly taken with the young one; he would die for her joy. It was the beginning of a fresh start he had desperately needed, one that Scythe hadn't been able to understand. Debate had them grow close, as it was coupled with a genuine curiosity and a will to see strange viewpoints. Such gratitude could gain anyone's loyalty, Scythe acknowledged, and he didn't need to look at her to see the soft smile that played upon her face, one nearly identical to his own. He could hear it in the dry, whispering rustle of her voice; the sound of dead leaves, of rolling bones. You love her, his mellifluous counter laughed, Admit it. You loved her as soon as you saw her. I admired her, Scythe countered, but there was joy to her words as well. She was born with knowledge that I took years to acquire. The knowledge of self, the knowledge of comfort within her skin, and a comfort with death that still held compassion, empathy. It had been a dearly won lesson for Scythe, granted only through her Circle, through her mate, Cast. The stallion in question had retreated deep to his home, but for her it didn't matter; she loved him just as fiercely as she ever had before. He helped to shape her, to create who she eventually became. Absence could not change that. That was the difference, between her and the friend that walked with her. She at least had her memories. He had had nothing. To extend loyalty, to be close to anyone when he was tangled in ghosts; it had been beyond him. His only redemption had been freedom. It had been hard for her to understand how it could even be an option; Circles were sacred and transcended even Bondeds. Eventually, however, they came to know one another's minds well enough to absorb their vastly different viewpoints. They had accomplished this by long, wandering walks, exactly like the one they were now taking. You do not love her in the way of one who would bind to a Circle, Scythe continued, and tilted her head slightly to look at Thorn from the corner of her eye. Do you plan on trying again? Are you seeking someone worth trying with? Right now, I just want to make connections again, he admitted, and gave a small snort at the thought of how severely reclusive he had allowed himself to become. Whatever comes of those encounters will reveal themselves in time. Be still, Thorn said, his voice purringly soft as he lifted his head high while she all but held her breath beside him. Do you hear that? Rustling. Faint, quiet enough that they had nearly stumbled directly into whatever the source was; their conversation had covered the sound until it was nearly too late to detect. It was just out of sight; through some trees, or perhaps in a slight dip in the land? It couldn't be as far as around the great hill that the moon seemed to rest upon; closer than that. But, wait, a pale shadow against the sky, a lighter patch in the shimmering, velvety black tapestry of night. Someone was up there, all right. But was the stranger causing the sounds? It sounded much closer than the stranger on the hill. What was going on out here? The flattened grass created a rough texture when pressed between the hard earth and the weight of her body, perfect for satisfying each and every itch created by the tiny monster in her mane. Her body rocked back and forth until she was positive the little bug couldn't possibly still be hanging on. She paused to take in a deep breath, hooves still high in the air, before gently rocking to the side and rolling back onto her belly. Her breath stayed put for a moment, as every inch of her skin tried to sense any movement at all. When there was no evidence of creepy crawly little bug legs, she let out the sigh. Much better. It was quiet now, just the cool breeze and swaying grass. She scanned her surroundings. It didn't once occur to her that she might not be alone. She was content to lay in the grass, close her eyes, and enjoy the (now) calm evening. A few blades of grass fell from her mane as she shifted her weight. She nibbled at some grass in front of her, mostly just to mess with something as she wasn't hungry. It tickled the soft hair on her nose. OCCl: Sorry for wait, I get all set to post and either get called away for family or pets insisting that it was their time. As is, sit on key board, curl up in front of my face (cat tactics) or yell at me from the floor that it was play or walk time (dog tactics). That or what ever stomach/ intestine problem rearing its ugly head with intense pain, feeling so bruised could not sit up right/ or bend over, or my fav, not; severe nausea.... So, going to aim for this post and see how it goes. The electric blue and dusk purple stallion watched with some curiosity, the flailing mare. He searched the area around her, and spotted nothing that warranted her actions. He was perplexed, that much effort did not look like it be fun, so... Maybe extremely itchy? He watched Dart bait poor Spindle into a chase from creating a snow fall with his wings and bumping the tree. The golden and silver stallion took up chase and where Dart seemingly looked like he have run through a certain area of uncovered undergrowth, when he actually had jumped it. However, he beated with wings to cause the snow to fall to the ground. Their bonded-brother thought that was the route to the candy cane marked stallion and ran right though the uncovered plants. At the distance, Spectre was, he could not tell the bushes were of stinging nettle. The gold stallion almost got to Dart, and was going to give me a good nip but suddenly dropped to the ground and rolled around from an extreme itch on his legs, side and belly. Dart did get Karma later for almost barreling in on a dosing Hollyberry in the willow thicket. He veered and missed her, so SilverFlash told him, but it was her time of year. The ruby eyed mare caused all the snow from the willows to drop and snow in Dart. Spectre grinned he, would have liked to have seen that. This in mind, he did not see any plants down by the silver mare, but maybe it was a slow acting one... If Rain was around, he ask him to cause a light shower to help her out, but the blue stallion was off somewhere else. He shifted his from side to side. He was not as out going as most of his bonded-family. Sure he now could probably get close without being noticed because his bonded helped him change his golden manacles into leg bracelets. The golden chains stuck onto of the golden bands, before we probably would have sent the mare flying with hearing the eerie sound of chains being pulled along the ground at night. At one time it was fun to watch the others start, but after so long of those jangles sounds, he was done with them. However, they were apart of him, something he could not be parted from. He relaxed and chose to observe the scene more, now that the mare was resting and not rolling about. He closed his eyes and enjoyed the breeze playing with his ghost fire mane and tail. Silence came before too many seconds had past, bringing the pair to trade a look. If it hadn't been such a localized rustling it would have been easy to pass off the strange moment as a particularly vigorous gust of wind. The only way these two would believe that, however, was to see the sudden tornado for themselves. There were places where small whirlwinds randomly stirred up the earth, but typically this wasn't one of them, so until it appeared in front of them there was no way that the sounds they'd heard just beyond the bush was any sort of wind. Unless, of course - maybe an elemental? But if that was so then the next natural question would be: Why? Shrugging, Thorn stepped forward, Scythe hugging his tail (or at least, getting as close as she could without being stabbed). The plants rustled around them, as well, but nowhere near to the degree they heard a moment ago. 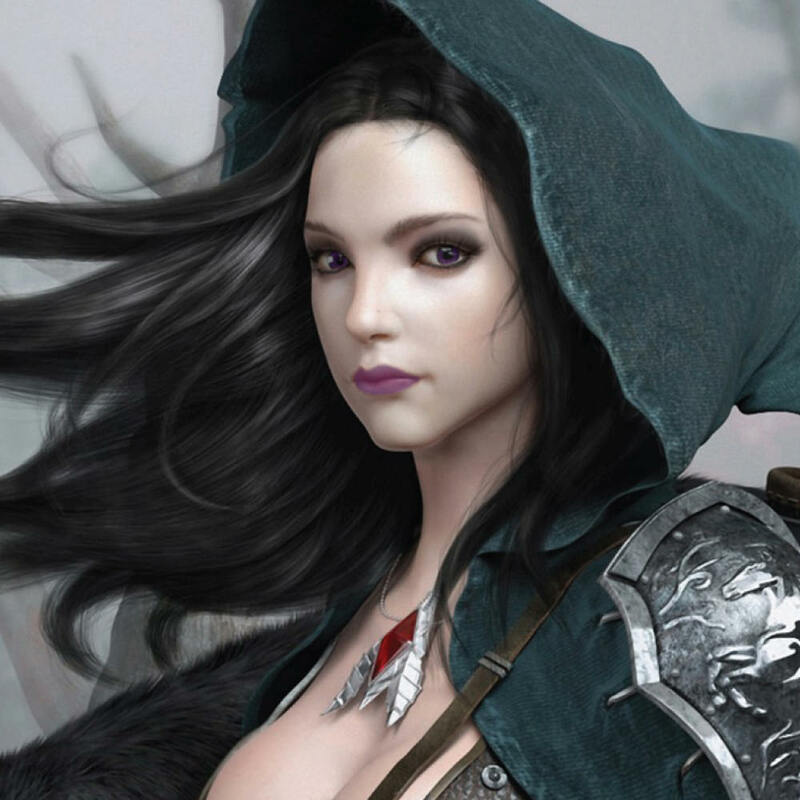 The deep blue and gray tones blended well with the shadow of dusk, but the blood red mane and glint of gold over her wings made her stand out, even in the depth of night. The scent was certainly that of a mare, and her build supported it; solid, yes, but still lithe, still something that was just a touch more than simply sturdy. Another glance, a look that lasted for only a breath, and Thorn stepped through the last of the obscuring plants and called Since I can conceive of no manner in which one might come to such a place in the hope of solitude, I have to believe that you're not entirely adverse to having someone stumble over you. He didn't quite point out that his phrasing could become quite literal with the right company - perhaps the more reckless sort that may or may not charge around blithely following fireflies. It's nice to see a new face, Scythe added, smiling in greeting as she drew even with her bondkin, That's the fun part of wandering around this area; never knowing who you might run across. Thorn looked up as Scythe gave her greeting, trying to see if he could still spot the stranger that stood on the distant hill. He wasn't sure why they were keeping their distance, but he wasn't going to draw any unwanted attention to them either; and it was surprisingly a bit more difficult to find where that silhouette had been now that they'd come just that bit closer. It was odd... But probably not a threat. Not here, at least. Speaking of which, he said, his honey-smooth voice carrying a note of amusement, it might be helpful if we introduced ourselves. I'm Thorn, and this is my bondkin, Scythe. Bondkin was a new phrasing recently coined by the Princess, AuraSidra. It had quickly caught on among the others, especially as her logic was fairly sound. Although they were in no manner truly related, OakHeart was as good as her brother - kin through their upbringing, through their bonded. You have beautiful eyes, Scythe noted, and there was a touch of endearment to her voice as she said our bonded has that same tone of icy silver-blue. I must ask about your wing caps, Thorn added, a curious tilt to his ears as he stretched his neck forward to squint at the gold that shimmered in the moonlight. Doesn't it cramp your wings, to keep them held that way? It was hard for him to imagine arresting any of his limbs in such a manner; eventually he would simply have to flex his poor muscles! But perhaps her wings had seized up, and the caps were meant to provide the needed stability to keep them from flopping loosely at her sides? Whatever the case, there had to be a story here. Scythe tossed her heavy mane with a rattle of bones as she took another step forward, sniffing curiously at the smooshed grass while Thorn squinted at golden wing caps. The grasses looked flattened in a rather large area for a mare that had been laying demurely... Actually, a good scratching roll sounded pretty nice right about now. She didn't often get the chance to indulge in such luxuries provided by grass; not within her desert home, at least. We were simply taking a walk and enjoying the night, she said, almost as if by way of apology for Thorn's curiosity, huffing slightly as she flopped down and rolled about in a very satisfying, back-scrubbing wriggle. Thorn had been saying that he was looking forward to being able to make new connections with others, now that he's given up being the Hermit. I am a bit out of practice, he admitted, shaking his head at her antics, but then, with your Circle being as quiet it is, you haven't had much interaction with anyone yourself. Don't listen to him, Scythe countered, winking at their new acquaintance as if she and Scythe were now a team, He isn't counting himself in that statement. Thorn simply rolled his eyes and shook his head a little, indicating and old, half-teasing debate. Of course she would insist that their long, wandering talks counted as socializing; he maintained that socializing with someone who had only recently been the Hermit amounted to the same as having a pet rock. Of course, that usually quickly devolved into comments about having pebbles for brains, and thus the whole debate would be derailed into senseless shenanigans. They had become fast friends, these two, but a new companion would add an extra splash of color that was more than welcome. OOC| Yikes! I hope it gets better soon - I had hoped it was better, honestly, and you were simply busy!